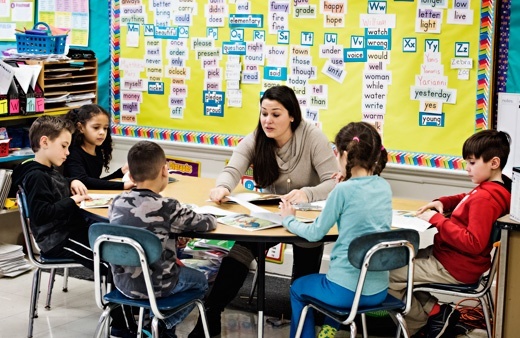 Guided reading is not a static concept; the materials, teacher decisions, and interactive framework change over time as students grow in knowledge, skill, and independence, and teachers become more experienced. Fountas and Pinnell believe that teacher expertise and the professional development that supports it is the only way to raise student achievement. High-quality, highly effective implementation of guided reading involves a process of self-reflection. Each time you work with a small group of students, you can learn a little more and hone your teaching skills. For example, in guided reading lessons, the goal is to teach the reader, not the text. Self-reflect: Think about how your language interactions with readers support the ability of each student to initiate problem-solving actions. Ask yourself: How does my language support pass control to the reader? What have I taught the readers how to do today that they will be able to do with other texts? Remember, reflective teaching is rewarding because you are learning from teaching. From Guided Reading: Responsive Teaching Across the Grades by Irene C. Fountas and Gay Su Pinnell. Copyright (C) 2017 by Irene C. Fountas and Gay Su Pinnell. Published by Heinemann.